The price of most digital cameras trend downwards over time, and the same should occur in the case of the Nikon D3000 digital SLR camera. I’m not planning for any scheduled updates, but do check back here from time to time for the latest prices and availability information on the D3000. Nikon D3000 10MP Digital SLR Camera with 18-55mm f/3.5-5.6G AF-S DX VR Nikkor Zoom Lens: $449.00 ($1.58 price reduction since the last update). Click here to check out what other options, configurations and kits are available for the D3000. Nikon EN-EL9a Rechargeable Li-Ion Battery for D3000 (7.2V / 1080mAh): $37.99. It’s a good idea to purchase a spare battery as a backup so that the camera doesn’t run out of power during extended shooting sessions. The D3000 is also compatible with the older EN-EL9 battery, which holds slightly lower amounts of charge (7.4V / 1000mAh). For storage, the D3000 uses SD or SDHC cards. 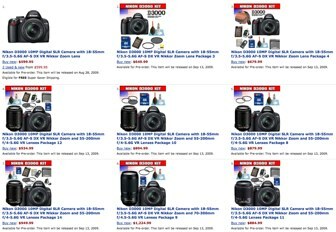 Good luck shopping for your D3000! 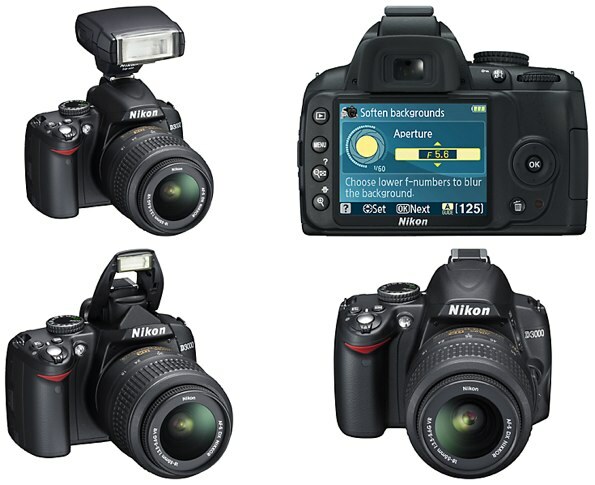 Nikon D3000 10MP Digital SLR Camera with 18-55mm f/3.5-5.6G AF-S DX VR Nikkor Zoom Lens: $527.84.